As we were growing up most of us were taught the basics of dental health care. Be sure to brush at least twice a day, floss your teeth after every meal, and use mouthwash to help eliminate the germs that cause bad breath. We were warned about cavities and abscesses and root canals, and that we only got the one set of teeth once we were adults, but what we need to know about caring for our teeth doesn’t end there. 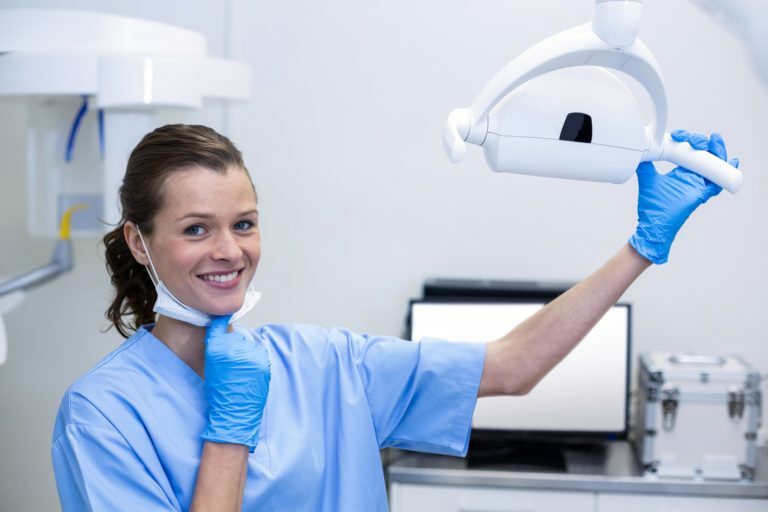 At most visits to the dentist, you’re going to spend some time with the hygienist, and there are some important questions you can ask them while you’re there. So there are you are, sitting in the chair, waiting patiently as the hygienist takes care of your oral hygiene prior to the doctor seeing you, and wondering how well you’ve taken care of your teeth during the previous six months. This is the perfect time to throw a few questions at your hygienist and see what you can learn from them! Where have I been missing with my brushing and flossing? Unfortunately, it’s not possible for us to clearly see into our own mouths, so while we may think we’ve been doing a good job taking care of our teeth it’s likely that there are areas we could improve on. Your hygienist is already taking a close look at your mouth, now’s the time to get their advice on where you may be lacking. Can I improve my brushing and flossing routine? While it’s true that practice makes perfect, it also is true that imperfect practice makes perfectly imperfect. To untangle that knot, if we do something the wrong way over and over again, we get just as good at doing at wrong as we would have at doing it well. If you’re looking to improve your flossing and brushing routine speak up and ask the hygienist for tips! Am I using the right oral hygiene products? This is another question that not enough people ask their hygienist. The dental aisle in your pharmacy is positively loaded down with an extensive collection of products you could use on your teeth, so which do you pick? Have you selected the right ones? Which ones might be better for you? All of these are great questions to ask your hygienist! Make An Appointment With Your Hygienist Today! If you haven’t had an opportunity to ask your hygienist questions like these, and it’s been more than six months since your last appointment, pick up the phone and give Dr. Alireza Movassaghi a call at Alameda Dental Group in Walnut Park, CA. Their team of experts has been helping forward-thinking patients like you perfect their dental hygiene routine for years, and would be proud to have you join their dental family. Don’t let another day go by practicing poor oral hygiene techniques, make an appointment and talk to your dentist and hygienist today!